Construction on the 2010 World Expo’s Hebei Pavilion will end on April 19, putting the building into trial operation starting April 20, according to the World Expo Office of Hebei province. 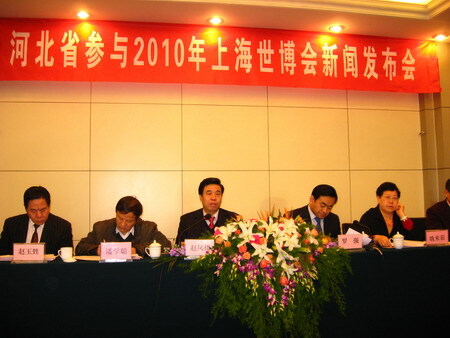 The World Expo Office of Hebei province holds a press conference on April 13. The design of Hebei Pavilion is inspired by the province's art of interior painting. The pavilion is marked by five interconnected geometric “cubes,” surrounded by a huge glass wall. The five cubes, like strands of DNA, form an integral "living being." Hebei Pavilion features the theme of “Charming Hebei, Beijing's Garden,” showing Yan Zhao’s (Hebei’s ancient Chinese name) 5,000 years of history and culture, according to Zhao Fenglou, chairman of Hebei Council for the Promotion of International Trade and director of the World Expo Office of Hebei province. The Pavilion will also showcase Hebei’s great economic achievements as well as local people’s efforts to build a more prosperous society. Mr. Zhao said Hebei has prepared well for its cultural performances, exhibitions and some other events. The venue is being designed and decorated. Performances and performers are well arranged. They will do their utmost to make all the events a success. Additionally, a business event during Hebei’s World Expo Week has received replies from over 60 invited guests. 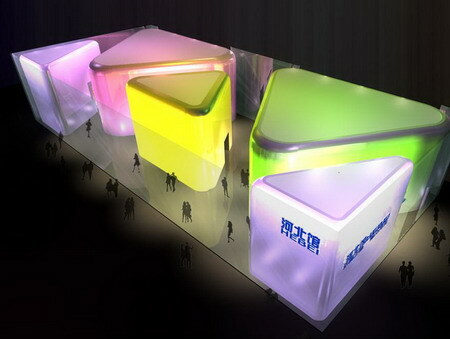 Virtual image of the 2010 World Expo’s Hebei Pavilion.